service image and create a New Campaign. Once the S.N.I.P campaign is created, an Integration link to publish your campaign on social media + a QR Code to publish on offline media is generated mapping to single inventory. 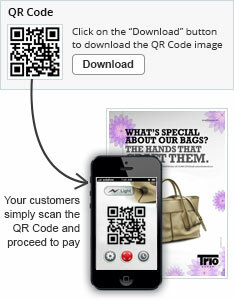 Download the QR Code and publish it in all offline media communication like posters, newspapers, magazines etc. Your customers get single-click access to the CCAvenue Payment Page compatible with all devices like desktop, mobile phones, tablets etc. Once the order is successful, transaction parameters are pushed back to the merchant website with complete transaction details in real time.